One key event in the evolution of both the conceptual ideas and practical working methods that would become central to future workshops occurred during John Cage's visit to Mountain Lake in 1983. Cage, who had developed a great interest in mushrooms in the 1950s, was one of the founders in 1962 of the New York Mycological Society. 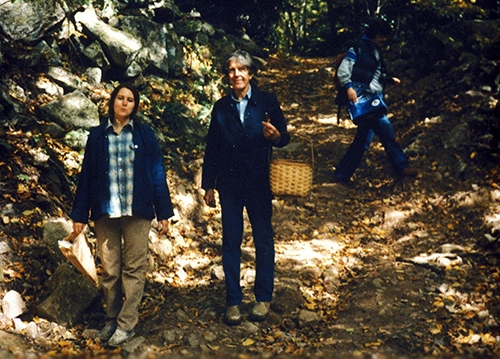 Cage's 1983 mycological foray revealed not only how to utilize the resources of the locale, its physical materials such as plants and rocks as well as its customs, but also the resources of the scientific community at Virginia Tech. 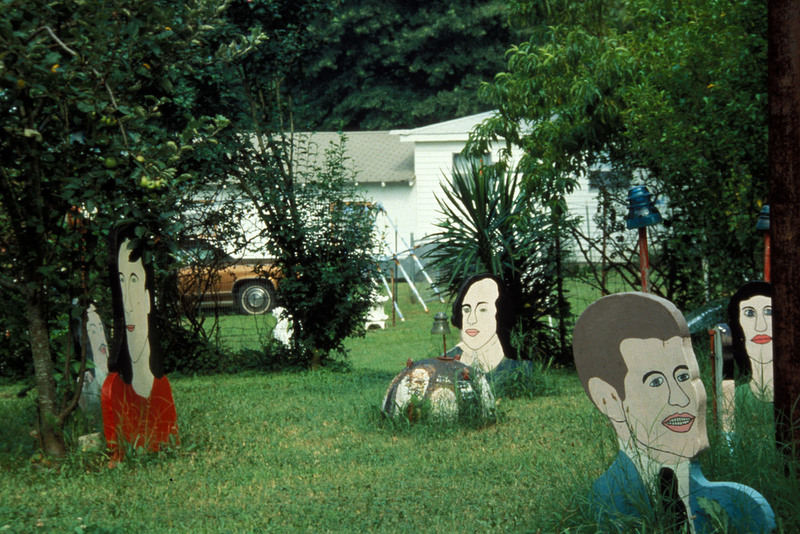 The first Mountain Lake workshop was directed by celebrated Georgia "outsider" and folk artist Reverend Howard Finster. 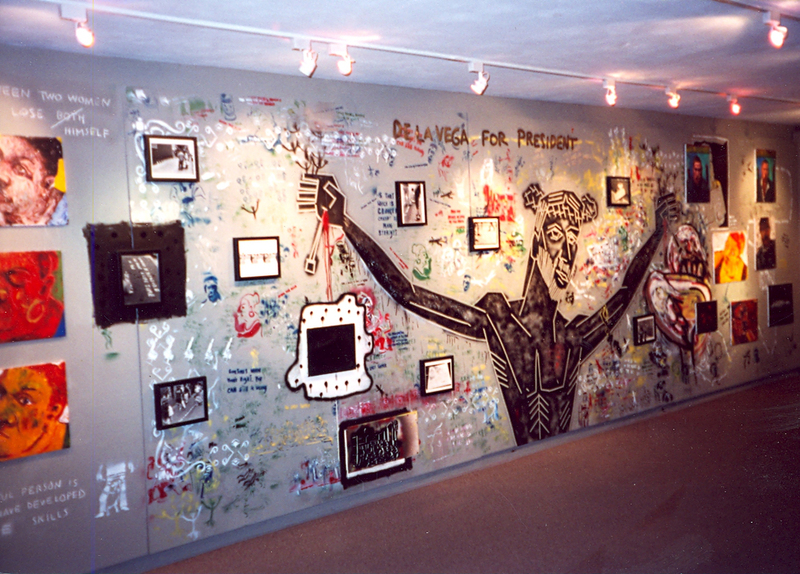 Many workshop participants cut out and interpretively painted stenciled patterns that they had individually selected from hundreds of Finster's "visionary" designs. This special collection demonstrates an essential aspect of Finster's artistic and aesthetic belief – that all images realized by the imagination are "visionary" and that the communicative power of a "visionary" image is inherent and can be conveyed by anyone's artistic effort. In 1988 Cage's schedule finally permitted him to return to Mountain Lake. At the beginning of April he arrived at the Horton Center and remained for a week-long workshop during which four series of works were produced. Following upon the 1983 "painting experiment," stones collected from the New River were sorted into three groups according to size, which were separately numbered; numerous and varied brushes were divided into two separately numbered groups; likewise, feathers to paint with, colors and washes, and papers were also divided and numbered. In this way, chance procedures using pages of random numbers that were now generated by a computer program could be used to determine the specific materials utilized for each painting. In 1989, Cage visited Kass' studio to see the new, large brush that had been assembled for him. By its sheer size (it is 5 ft. wide), it suggested new painting possibilities. Using this brush (which was so large the artist actually had to get inside its armature and it had to be loaded with paint in a wide trough with the help of assistants), Cage painted STEPS, a work that is 60x208 in. and recalls the AUTOMOBILE TIRE PRINT scroll that he had made with Robert Rauschenburg on Fulton Street in lower Manhattan, New York in 1951. However instead of the long, continuous imprint of an automobile tire that suggests the world of modern mechanized movement, this work features the isolated imprints of Cage's shoes and, like 12th century Chinese Sung paintings of lonely travelers among remote mountains and streams, it raises the timeless image of a solitary walk in nature. 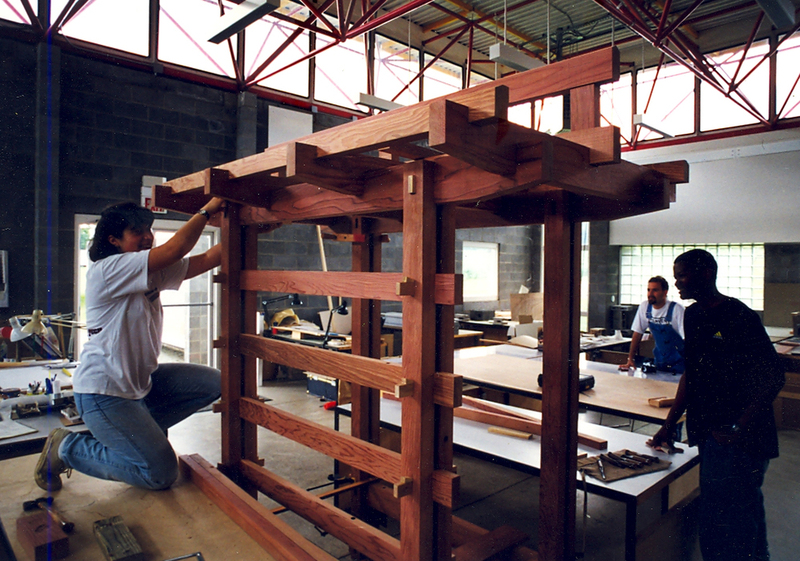 The focus of Okura’s workshops developed out of his deep respect for natural materials, especially wood. This respect is based on an understanding of the relationship between nature as an environment of material substance with physical location, and as a concept of pure space. Okura’s ideas, which are expressed by his treatment of wood, are manifested in Eastern belief systems through ritual practices that allow for chance and indeterminacy in the processing of materials. Such ideas paralleled the Mountain Lake conception of the self and locale as manifestations of both natural and psychic forces. Known fondly as “John’s Place,” photographs taken at the site on the New River where Cage acquired most of the rocks he used in his two workshops were made into polygonally-shaped photomontages by Kass as a personal memorial to Cage. From this came the idea of giving film to participants to photograph places of interest to them while on hikes on the Appalachian Trail near Mountain Lake. These photographs are then collaged by chance procedures into a long frieze. The exhibition METHANOGENESIS (the natural process through which methane gas, an essential component of the global carbon cycle, is generated as a by-product of decomposition) is the most collaborative art project accomplished by the Mountain Lake Workshop to date. Microbiologist, Dr. James Ferry, and artist-in-residence of the New York Sanitation Department, Mierle Laderman Ukeles, consulted with the Mountain Lake Workshop over a period of two years to create a unique exhibition of abstract artworks focused on the invisible, life-sustaining processes of anaerobic (oxygen-free) bacteria. M.C. Richard’s Mountain Lake Workshop was a week-long series of intensive group participatory sessions in drawing, ceramics, writing, and book-making. M.C. was an eminent ceramicist, visual artist, poet, and author of the landmark book, "Centering". Sumi-e is traditional ink and brush painting that has its origins in China. Michael Hofmann is a resident of Kyoto, Japan, where he has studied for the last twenty six years as an apprentice to the respected sumi-e master, Gyokusei Jikihara, regarded as one of the country's foremost painters. Hofmann visited the Mountain Lake Workshop in the summer of 1998 and conducted a sumi-e painting workshop to celebrate the Year of the Dragon. This workshop is about the experience of the subtle differentiations when a document transitions from film to video, and then to digital media. 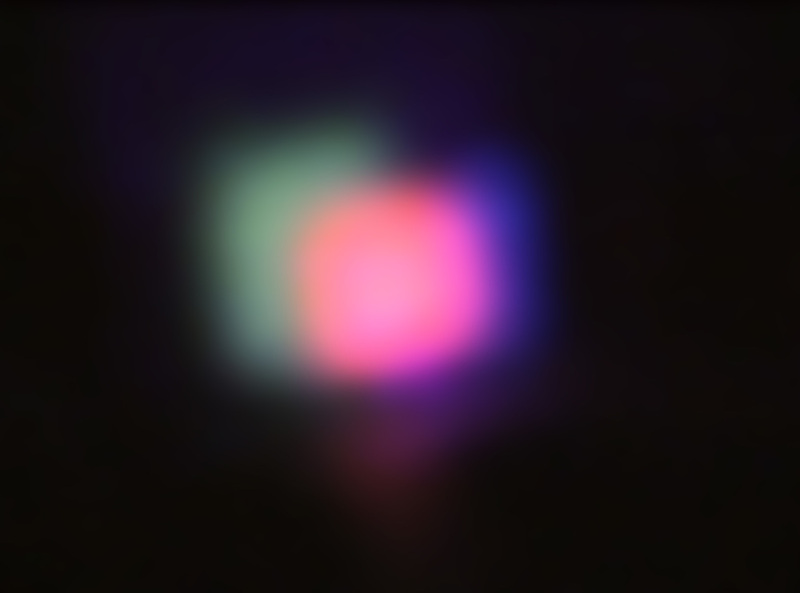 The video equivalence of projected light seen on a movie screen transforms the original experience into something very different. In each case the resultant imagery necessarily amounts to a parting of the ways - twins separated at birth. One of the events of the special summer study in Asian Art and Design involved building a rammed earth wall as a backdrop for an area developed into a Zen garden. Rammed earth construction has been used for over 2000 years and was most commonly used in the construction of houses in rural areas of China. This workshop engaged students and community members in craft-oriented, discipline-centered activities (gathering specific materials and treating them, weaving, carving, preparing ground, making structures, organic flotation devices, etc.) that utilized available natural materials to create (or simulate) natural animal habitats, as well as promote a greater awareness of the sensitive conditions of the natural environment. NYC community-artist James De La Vega converts the walls of East Harlem into an open air canvas documenting New Yorks's Barrio culture. 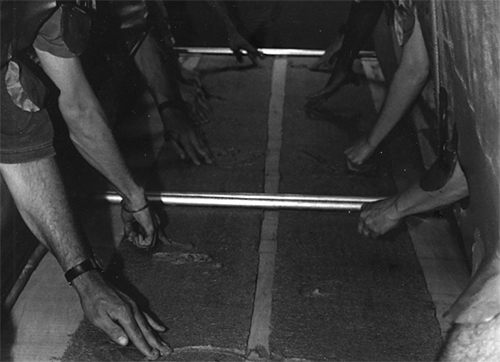 In March of 2000, James De La Vega visited Blacksburg to conduct a four-day Mountain Lake Workshop that directed participants in his unique activities of sidewalk chalk and tape inscription. In January of 2001, Ray Kass and the Mountain Lake Workshop asked Jackie Matisse to develop another space for her innovative work – a virtual environment hosted by Virginia Tech's University Visualization and Animation Group and School of the Arts. This collaboration produced a "groundbreaking" virtual reality CAVE allowing visitors to control their experience with Jackie Matisse's kitetails. For his Mountain Lake Workshop, Sauder transported a portable iron-smelting “bloomery” (modeled on the traditional African bloomery furnace) to Blacksburg and demonstrated the traditional method of smelting iron. More than thirty workshop volunteers participated in the profoundly meditative, discipline-centered skill of the “bloomery” iron smelting process; each participant wrought a significant chunk of red-hot soft smelted iron (as fibrous as the best hand-made papers) in the creation of an array of new sculptures. James Donnelly visited Blacksburg for a period of 9 days and participated in a series of scheduled events preparatory to his exhibition, including a Mountain Lake Workshop that created specific elements of the installation of his exhibition as well as led area students and community members of all ages in painting experiences based in creative self-portraiture and personal identification with flora and fauna in nature. “Three Graces” is a Mountain Lake Workshop collaborative art project and accompanying digital video documentary with photographer Sally Mann and her daughter, the artist and painter, Jessie Mann, and laser/light artist Liz Liguori, with a special workshop event to be lead by Sam Krisch, a digital photographer and Adjunct Curator for Photography at the Taubman Museum of Art in Roanoke, VA.
A daylong on-site workshop directed at “Three Graces” by Sam Krisch and open to community participation, assisted by Ray Kass and Ryan Broughman. Four large digital prints incorporating digital camera and phone-camera images contributed by thirteen community participants were produced in September 2013. All works produced in the Mountain Lake Workshop are the result of collaborative efforts between guest artists and members of the artistic, academic, student, and local community in the Appalachian region around Mountain Lake in Giles County, southwest Virginia. The following is a selection of programs that, in part or whole, may appear on video tapes in the Mountain Lake Workshop archival collection donated to the Library of Congress.